As a kind of material lifting solution, the trolley gantry crane can be used to raise working efficiency, and then arrive at the higher productivity. In our trolley gantry crane, the trolley is hung on the main girder of a gantry crane, while the hoisting mechanism is set up on the bottom beam located in the base of the gantry mounting leg. This special method adapted by our company use a small trolley that separate the hoisting mechanism from small vehicle walking machine, which obtain a small size and light dead weight trolley, leaving the lower power that gantry leg has to tolerance. 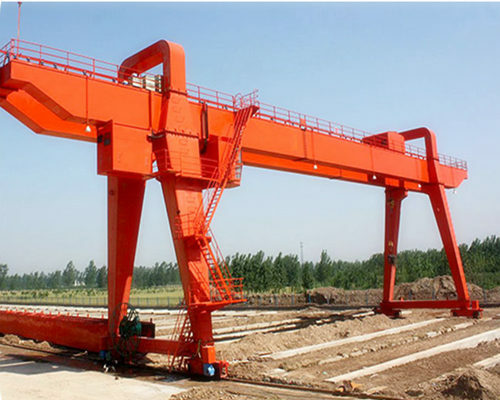 In a word, as a powerful and capable manufacturer, our company is quite confident to produce all kinds of gantry cranes to meet all your requirements with advanced technology and competitive price. Our main products mainly contains, overhead crane, gantry crane, jib crane and all sorts of hoist lifting. Besides, we are also accepting your order to customize your particular cranes to lift, move or transport goods. With over 80 years’ hard working, Ellsen machinery Equipment Company has been a leader in crane industry. Located in Zhengzhou, the heart province of Chinese transportation, our company enjoys unique geographical advantages, which provide the powerful backing for our fast delivery. During almost one century’s development, we possess a multitude of professional experts and skillful workers to offer the specific guidance for your crane’s design, manufacture, installation and maintenance. led by our correct enterprise spirit and strict standard, we acquire so many honorary title, “the best manufacture in China ””the most satisfied company among customers”, “the top 3 crane supplier ” and so on. Relied on the responsible attitude and advanced technology, we have exported our trolley gantry crane into more 40 countries and regions throughout the world, and build a long-term cooperation relationship with many famous groups, wining a great reputation among our customer, and becoming their first and best choice for lifting material equipments.